Lanius senegala Linnaeus, 1776, Senegal. About 12 races described, but a few poorly differentiated. Variation concerns size, coloration of back and underparts, and coloration and shape of superciliary stripe. French: Tchagra à tête noire; German: Senegaltschagra; Spanish: Chagra. 7.8-9 in (20-23 cm); on average 1.9 oz (54 g). Relatively large with a long, graduated tail and a heavy black bill; sexes are similar. Characteristic black crown and black stripe through eye; white, prominent supercilium. 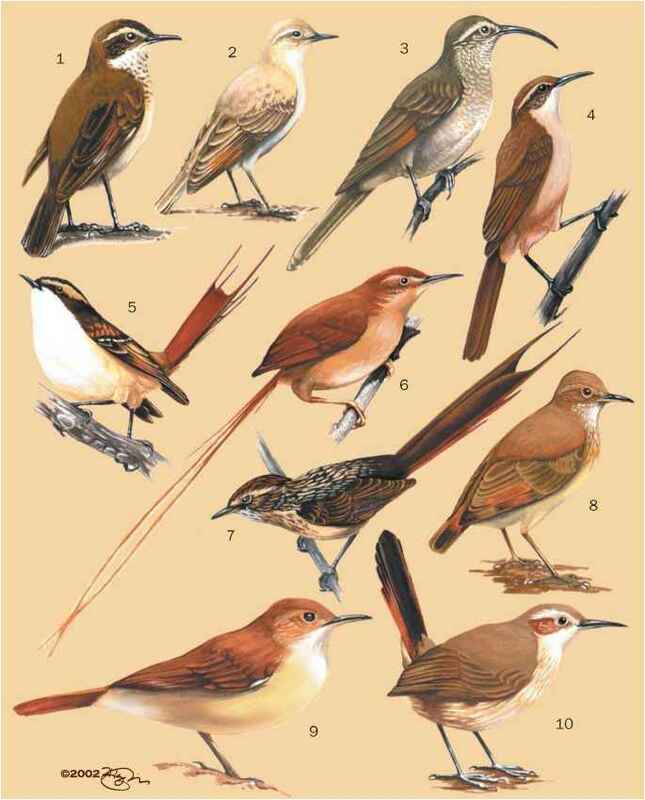 In nominate, upperparts are gray brown; tail is dark fringed and tipped white; underparts are pale gray. Juveniles are similar to adult, but duller with a mottled crown, buff eyebrow, and paler bill. The Arabian race percivali is the darkest one, relatively similar to the North African race cucullata, also darker than nominate; on the contrary remigialis from Chad to Sudan is very pale with almost pure white underparts. Rather a coastal species in northwestern Africa from Morocco to northern Libya (race cucullata). Nominate occurs from Senegambia to Sierra Leone. 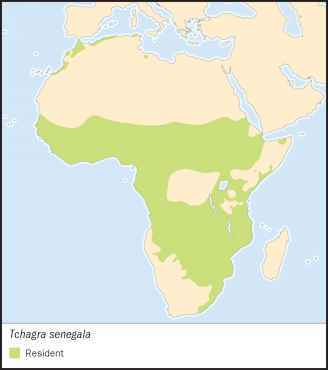 Other races widespread in sub-Saharan Africa, except in the Horn, the Congo basin, and the southwestern area of the continent. Wide range of semi-open habitats dotted with bushes, thickets, and isolated trees; sometimes occurs in forested habitats, in Ethiopia, up to 9,800 ft (3,000 m); also in plantations, parks, and gardens. The male defends a rather small territory covering about 10 acres (4 ha). Generally secretive; likes to keep to inside of bushes, but song of warbled whistles betrays its presence. Also conspicuous during display flights, when it can climb up to 50 ft (15 m) before gliding downward in full song toward another perch. Spends much of its time hopping on the ground where most prey is caught, particularly near bases of bushes and trees. Only local movements are known and only in a few areas. Arthropods, mainly insects, particularly grasshoppers and beetles. Small reptiles and amphibians, as well as berries, are also taken. Monogamous, occurs singly or in pairs. The nest is a shallow cup, built in a bush or small tree generally between 1.6 and 6.5 ft (0.5 and 2 m) above the ground. A normal clutch contains two or three eggs (rarely four), which are apparently incubated by both sexes, but probably mainly by female, for about 14 days. Over the vast range, laying may begin in all months with local peaks, possibly favored by early rains. Normally only one clutch. Young leave the nest when they are about 16 days old. Not threatened. A few isolated races like percivali in the southwestern Arabian peninsula, might, however, deserve to attract the attention of conservationists.